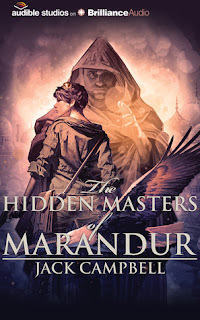 The title implies that Marandur will be a main setting or at least a big deal. It does have major implications for the story, but it takes up less than a quarter of page-time at the end of the book. It was strange placement, not very exciting, and felt more like setup for the next book. Meanwhile, romance is the star of this book. Unfortunately, the emphasis placed on the romance really detracted from the story. Instead of being a fantasy adventure where they're running for their lives--with a dash of romance on the side--I felt like I was in a YA romance novel with a dash of fantasy and adventure on the side. There is so much to work with here! So many questions, so many conflicts! But the author keeps hitting the reader over the head with Mari's identity as the daughter of this prophecy and how much she and Alain love each other. It slowed the pacing, tension and interest level dramatically whenever they weren't in the midst of (literally) running for their lives. I had issues with repeated phrases/sentences/paragraphs in Dragons of Dorcastle. This book has the same problem, possibly worse; and this time, it was usually the repetition of useless sentiment, emotion, feeling, romance, etc. I can only take so many conversations about feelings between these two, especially now that Alain is more a regular guy and less a mage. He still has the powers, but he's talking and behaving and feeling more like a "perfect boyfriend" who lives only for Mari, always does what Mari wants, and seems to have zero flaws and/or thoughts unrelated to Mari. Basically, he's Edward Cullen. It's less interesting, less humorous, and kind of boring. I still think they should have drawn out the potential romance over several books before having anything concrete happen. Trading "I love you's" in the first book is never a good sign. It's like if Tony and Ziva had gotten together in their first NCIS episode. The tension and wondering and potential would be over, it would be boring, and no one would watch, or write fanfiction.